The university is redefining its leftover food. 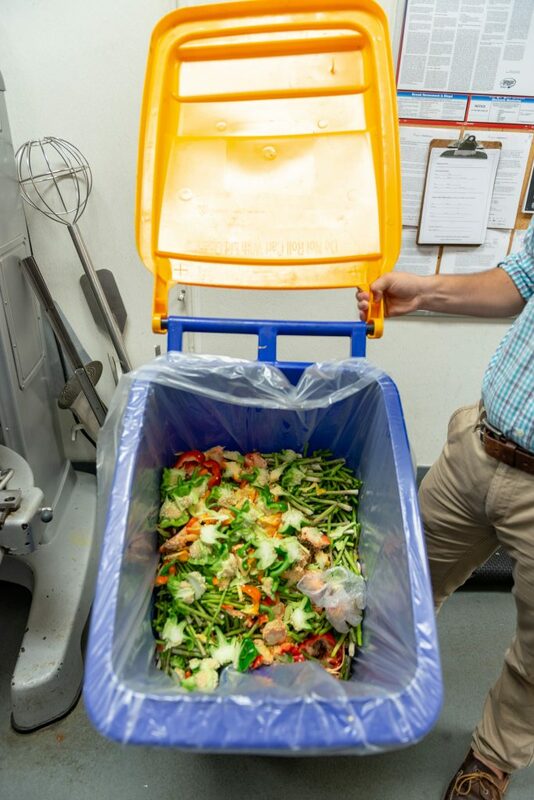 Food scraps from student plates at Connecticut Hall are collected in compost bins which is turned into energy at a composting plant. Leftover food is sent to St. Ann's Soup Kitchen in Hamden. The Connecticut Hall kitchen is closed and the last of the students are exiting the cafeteria. Leftover pizza, and other entrees remain under the hot lights waiting to face their fate; the trash bin. From the bin to the dumpster to the landfill, there the food was to remain and decompose. 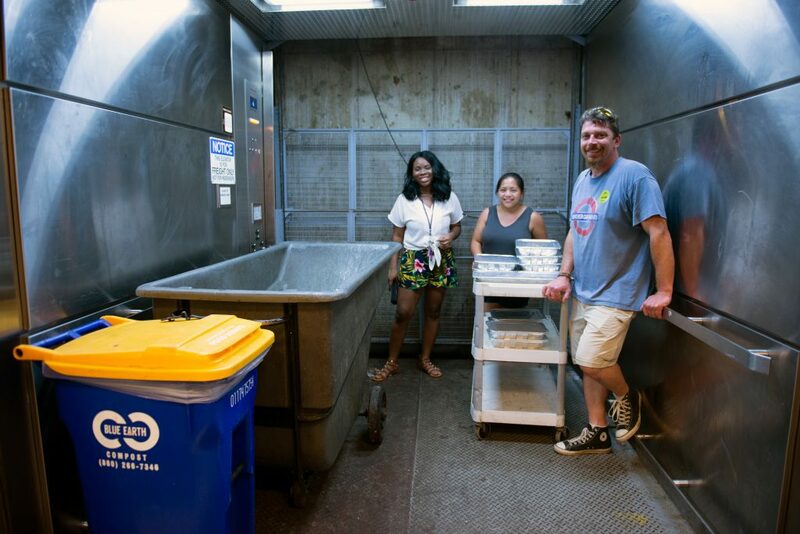 However, in 2016, the Office of Sustainability, in collaboration with Chartwells and the Food Recovery Network, worked to change the fate of the leftovers that students leave behind. 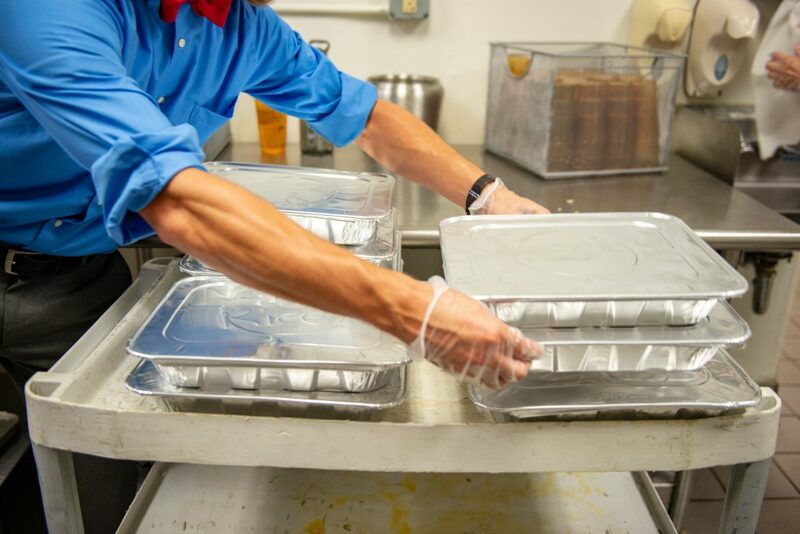 Come 9 p.m., the food recovery program, run primarily by student-volunteers and interns, rushes in and tightly packs some of the remaining food into recyclable aluminum trays so it can be transported to St. Ann’s Soup Kitchen in Hamden. In as little as 30 minutes, students save fresh food from being tossed in the trash. From spring 2016 to spring 2018, the program donated 33,677 pounds of food that would have otherwise been thrown away. This equates to 28,000 meals that have been served in the New Haven community, says Heather Stearns, recycling coordinator. Minor says the program follows a three-pronged approach: food is delivered to a community, waste is reduced, and the program serves as an outlet for students to channel their energy into helping others. Food prep materials and unfinished meals left on a student’s tray are thrown into a compost barrel, which is turned into energy at a composting facility. Stearns says 42 tons of compost has been kept out of waste systems. Prior to the program delivering the food to St. Ann’s Soup Kitchen, the staff were cutting portions in “half” and in “thirds” to compensate for the number of people that needed to be fed, she says. 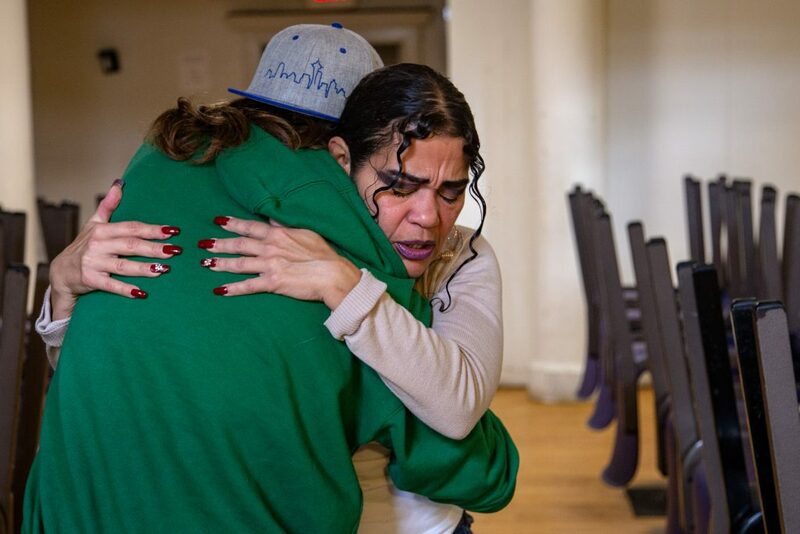 St. Ann’s is in one of the neediest areas of New Haven, with many people in need of food. Sometimes, she says, it is a choice between paying a bill or eating a meal for the individuals who rely on the food—most will pay the bill. Lucy Fernandez, manager of St. Ann’s, says that Yale University has donated before, private donors have stepped in, but the amount of donations has always been fluctuating. Fernandez said the change in donation flow since Southern has been involved is “dramatic,” and visually noticeable, day to day. 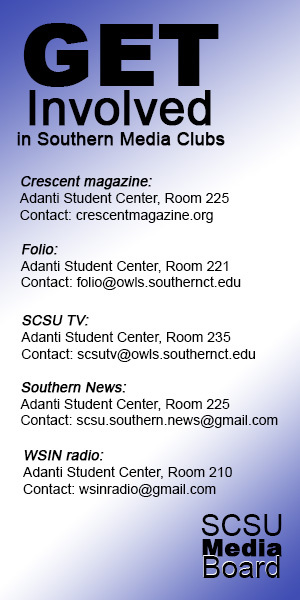 “Since Southern stepped in, it’s been so much better,” she says. From Sunday night to Friday night, volunteers commit to collecting the food, says Stearns. In spring 2018, 133 volunteer hours were contributed to this program from 16 different volunteers. This program is all student-driven under the supervision of Stearns and Sustainability Coordinator Suzie Huminski. 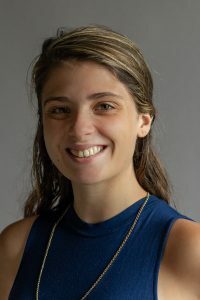 The volunteer aspect of the program educates students on the pace and expectations of Connecticut Hall workers, says Minor. The number of volunteers varies, but members from Zeta Delta Epsilon, other fraternities and sororities, residential assistants and the geography club will consistently send volunteers. Minor says on a weekly basis six students will sign-up. 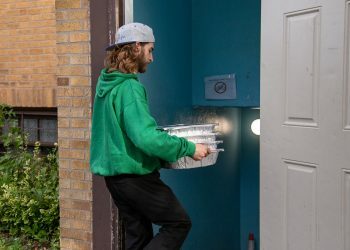 During one of their nights of food recovery, David Bakies, a senior environmental studies major, who volunteers for the program, says the leftover food does not stay out long. 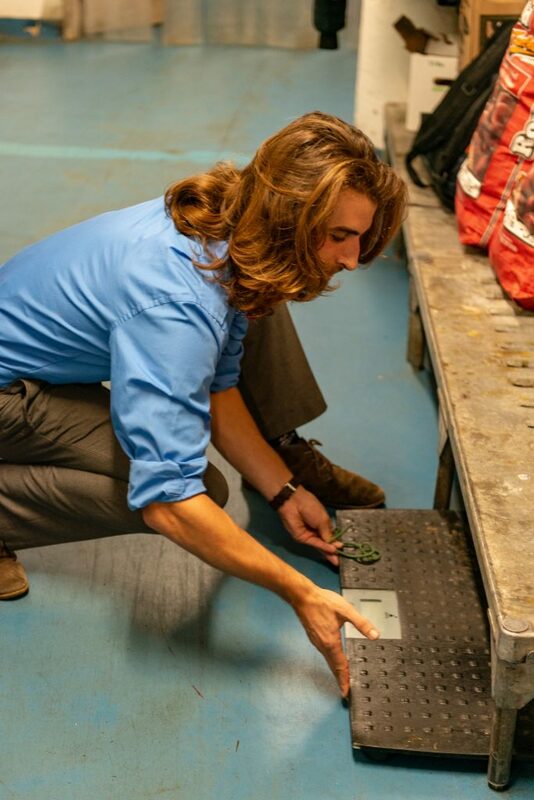 “Once it comes off the line…it gets containerized, put on the cart, and then it goes right downstairs,” explains Bakies. David Bakies carrying food into St. Ann Soup Kitchen. One item of food that is consistently transported is pizza due to its exclusive station in Connecticut Hall. Minor says every day, volunteers could deliver five to 10 slices of pizza. In addition, Connecticut Hall offers many meal selections, thus creating more waste, says Bakies. Being conscientious of when food spoils adds a further component into deciding what food can or cannot be delivered, he says. This past semester, the program branched out more with what food they could take. Bakies says St. Ann’s can usually find a good way to use and serve the food. “They do not turn anything away,” states Bakies. If St. Ann’s is closed, some of the food will be delivered to other locations such as the Legion of Christ in Cheshire, says Stearns. The administrative relationship between Chartwells and the Office of Sustainability can possibly keep food from being over-produced at Connecticut Hall. Minor explained that the data from the program is shared with Chartwells, and changes can be recommended to their food production based on it—although Chartwells will make the final decision. “That is where sometimes maybe one party thinks they are over-producing because by our statistics you could be cutting down on x-amount of food because we are receiving x-amount of waste, or x-amount of food on Fridays or something like that,” says Minor. However, Minor says the program can communicate any problems with Chartwell workers and kitchen staff to prevent potential crises. The administrative relationship is still slightly more disconnected. Minor says this is due to a change in management at Chartwells and the distance between Connecticut Hall and the Office of Sustainability. “That administrative relationship is a little more disconnected and it doesn’t have that opportunity to really sit down and hash out anything,” Minor explains. Working at Connecticut Hall might not be the only job these workers have. They could have other jobs in addition to this, explains Bakies, and due to their union requirements, their windows of time to complete these jobs are small. However, some, he says, live in the Hamden area and understand how important the soup kitchen is to the community. Bakies says he initially became involved in the program due to his passion for the environment. For him, the two and half to three hours a day it takes to transport food is an added plus for the environment and the community.